(Per Lt. Con Costello) Bill's Family Tree is being compiled presently....will be attached post permission granted. Additional nice pictures would be great! GL3 WILLIAM JOHN "BILL, W.J." 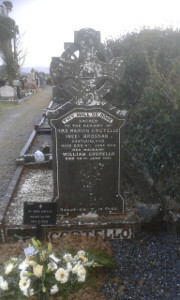 COSTELLO was born on 23 Aug 1891 in Kilsarcon to Parents John 'Jack-Bill' Costello and Mary Crowley from MountFalvey. 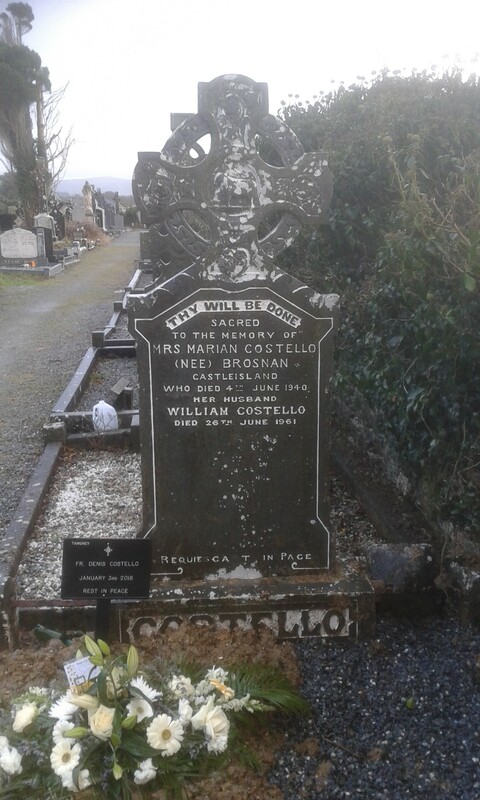 He died on 26 Jun 1961 in Castleisland, Co. Kerry. 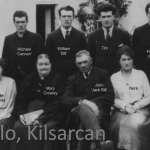 Baptised in Currow on 23rd Aug 1891 and went to School in Kilsarcon and Currow. 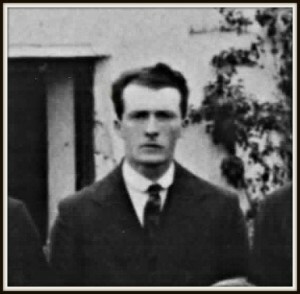 He joined the RIC and served in Bennetsbridge in Co. Kilkenny on 28 August 1911 where he was friendly with the family of Bryans, of whom Dan was later a Col. and Dir of Int. during WW2. Police RIC member number 66086. A farmer before joining, he was referred by DJ McDonagh, farmer Appt. 28 Nov 1911. Height 5' 11.5". WJ came to Naas on duty with the RIC for the Punchestown races, when the police slept in the town hall. He resigned from the RIC, possibly as the behest of his brother Fr Michael, 8th July 1918 "because of insufficient pay and unpopularity of force". From H0184 papers PRO Kew, London. 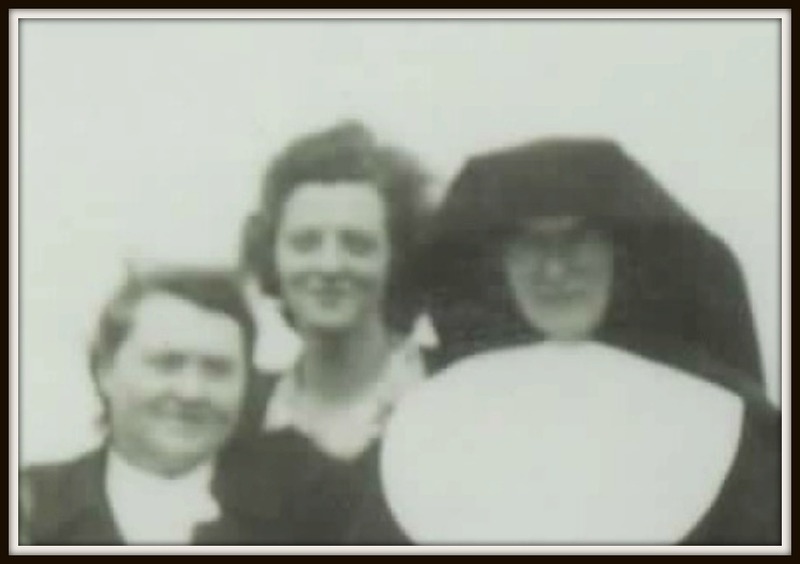 After he married Mary Anne Brosnan, he went into business on Main Street Castleisland with his wife. Devoted to Michael Collins, he hung his picture in the shop. 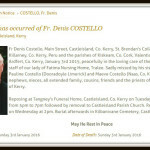 He was for many years local correspondent for the Kerryman newspaper , and he was a well known wit and conversationalist. He played the fiddle, and his public house was a meeting place for the local traditional musicians, a base for matchmaking, and for cattle jobbers to pay their clients on fair days. He was a friend of famous musician Patrick O'Keefe. 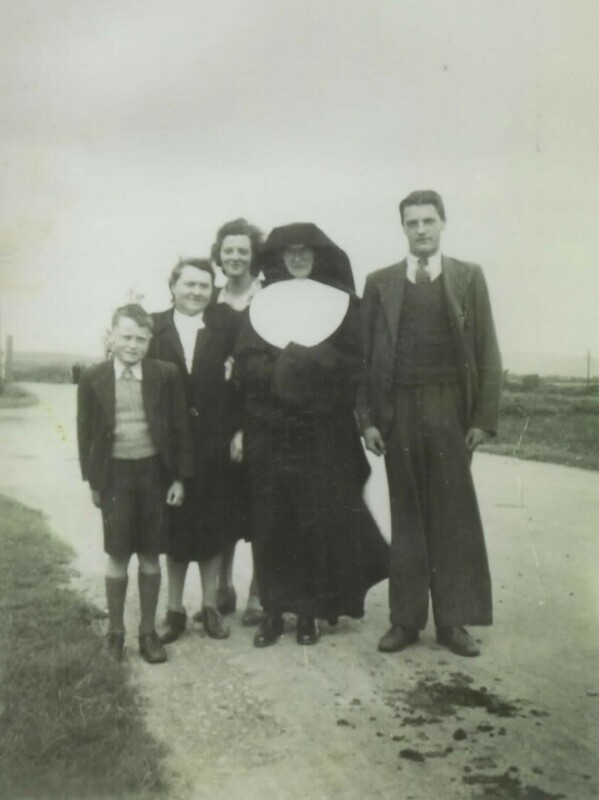 Re: Mary Anne "Marian" Brosnan: In the 1911 Census, at age 23, Maryanne Brosnan is listed as Head of household, with brother John (15) and sister Nora (22) listed, along with Uncle James Keane (75). 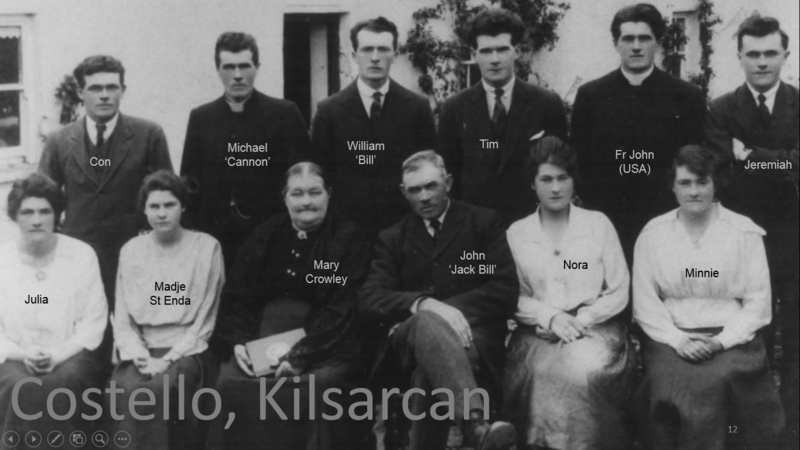 Children of GL3 William (Bill) ‘Jack-Bill Costello & Marian Brosnan, Tullig. Educated at Castleisland NS and St Brendan's Killarney. Served in the army during WWII, later joined Aer Lingus at Shannon Airport and became freight manager. Owner of a successful market garden in Limerick City, with large areas under glass. 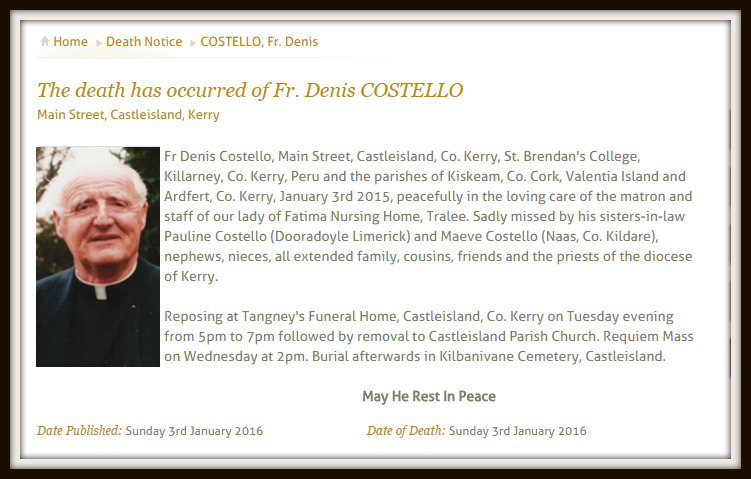 D03/01/2016 at Fatima Home Tralee. 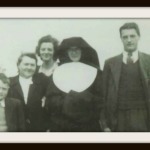 Ordained in College Chapel Maynooth by Archbishop John Charles Mc Quaid of Dublin on 19th June 1949. 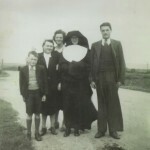 On loan to Motherwell Diocese, serving in Shotts, Lanarkshire 1949-1950. Professor in St Brendan's College 1950-1970. Retired - Jul 2000 to Killarney & then Fatima Home Tralee. Mikie also wrote a lovely affectionate piece in appreciation of the life of his Uncle, Fr. Denis. Click HERE. 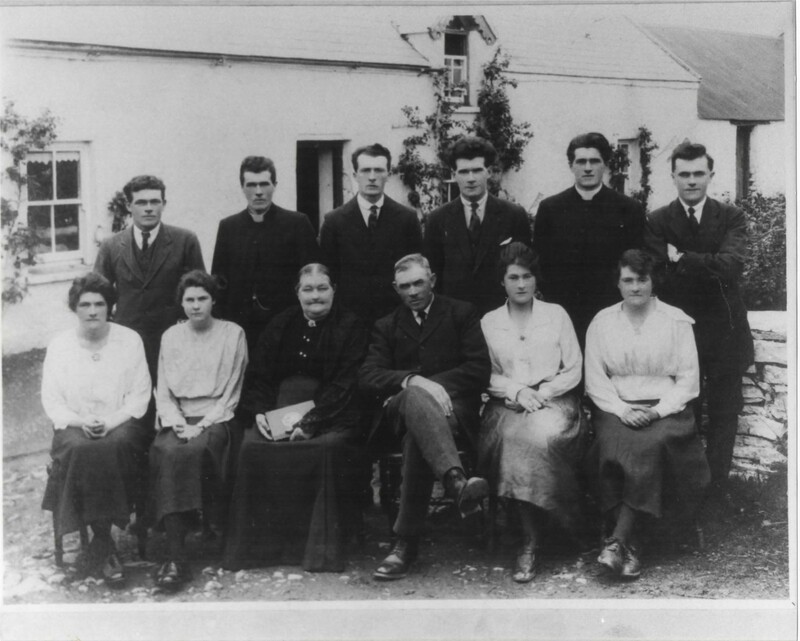 Mary married William 'Liam WH' O'Connor B16Apr1915 Castleisland D08Nov2003 Castleview Castleisland, son of William Hugh (WH) O'Connor (Coolnageragh, Scartaglin) and Julia Blennerhassett. 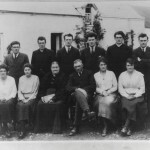 Liam WH was born into Kingdom House, Castleisland, Co. Kerry. Liam's Father Hugh helped setup the "Rhyno mills" animal foodstuff business after returning from South Africa where he had made money. Mills presently owned by O'Connor Family. 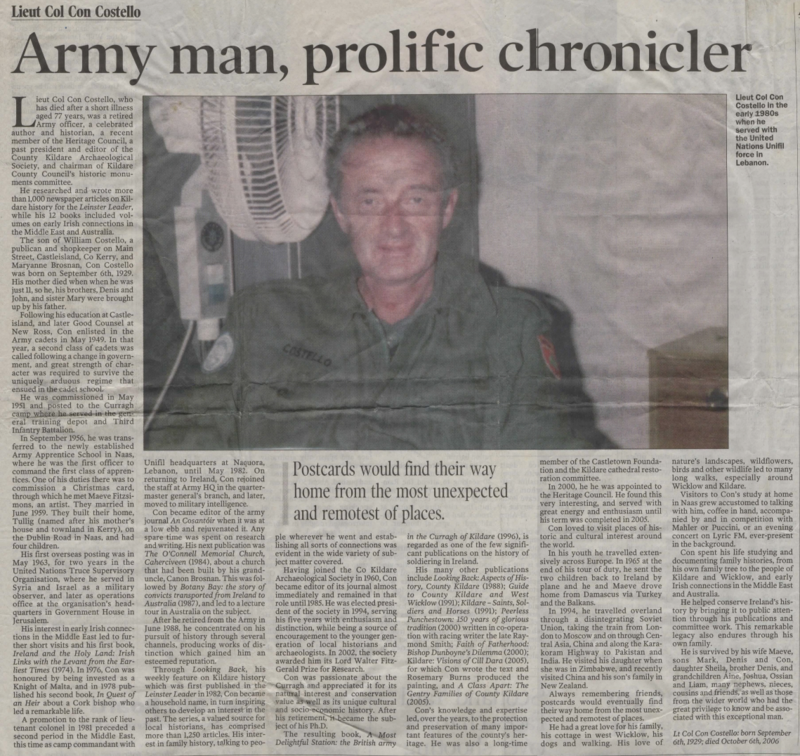 Re: Lt. Col. Cornelius 'Con' Costello. Military College 1949, commissioned May 1951. On commissioning served in GTD, McDonagh Barracks, Curragh Camp. Then for three years edited Curragh Bulletin. As Captain, moved to Apprentice School in Naas when it opened in 1956, Pl Comdr No. 1 Pl. Built the family home at Tullig, Dublin Road, Naas in 1960, and bought and restored cottage at Glenavore, Knocknadroose , 1969. In May 1963 left to serve with UNTSO for 2 years; at Tiberius, Israel (6 months), then Damascus (Oct 63-May 64) and then at Government House in Jerusalem for one year. Drove home overland with Maeve in 1965. Returned to Army Apprentice School. There for 13 years and after a short while in 3 Inf. Bn. and Mil Hospital, CTC to AHO in Parkgate St, Dublin. 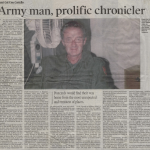 For eight years editor of army journal "An Cosantoir", then to Int. Sec. S. Promoted to Lt Col in 1980, and 1981-1983 appointed CC at Naqoura UNIFIL HQ in Lebanon. 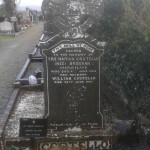 Chairman of County Kildare Historic Monuments Advisory Committee 1966-2006(?). Heritage Council member 2000-2005 . 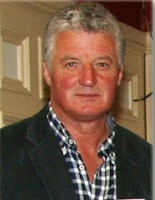 Director of Castletown Foundation; Kildare Cathedral Restoration Committee ; National Libraryof Ireland Committee. Hon. Ed. KAS journal , 1960s-90s (30 years) and President of the KAS for 5 years. Wrote for many publications, at first under the name Cornelius Brosnan. Travel articles in Irish Independent 1956-57, then the Word Magazine. Play: 1969, "Dunboyne", later adapted as a book. Author : Ireland and the Holy Land 1974; In Quest of an Heir 1978; The O'Connell Memorial Church Cahirciveen 1984 (pamphlet) ; Botany Bay 1987; Looking Back (collection of LL articles) 1988; Kildare: Saints, Soldiers and Horses 1991; A Guide to Kildare and West Wicklow 1994; A Most Delightful Station: the British Army on the Curragh (based on Phd thesis) 1997; Peerless Punchestown: 150 Years of Glorious Tradition (with Raymond Smith) 2000; Bishop Dunboyne's Dilemma: Faith or Fatherhood 2000 ; Kildare: Visions of Cill Dara (with Rosemary Burns) 2005; A Class Apart : the Gentry Families of County Kildare 2005 . Life Member of Military History Soc, wrote for Irish Sword. KM (Knight Malta) 1977. In 1994 travelled overland with son Denis from London to Delhi via Russia and Central Asia , and wrote about the journey in a series of articles for the Leinster Leader. Contributed weekly historical Looking Back column to the Leinster Leader from Oct 1982 to 2006; 1,261 articles in all. Re: Sheila Maeve Elizabeth Fitzsimons: Artist. Illustrator of numerous children's books, Christmas cards, newspaper features (for a time worked in the Irish Press), UNICEF diary, Irish Shell Calendar. Accompanied her husband Con to the Middle East living in Damascus and then Mount of Olives, Jerusalem with Mark and Denis, 1963-65. Wrote and Illustrated series of articles "Letter from Damascus" and "Sojourn in Jerusalem" for Irish Independent, 1964-65. 1994-2004 did many oil and watercolour paintings and sold them in exhibitions, including those of the AKA (Association of Kildare Artists) and Tuckmill Gallery. 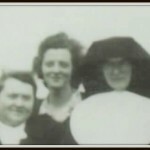 Fr(Denis, John, Michael),Eliz Brosnan&More: About Fr Denis, Elizabeth Brosnan, Fr John, Cannon Michael & Aunty & Mother Enda.